I have an 8 1/8" soup(?) spoon that may or may not be sterling. It has the feel of coin silver (thin and light weight) and two hallmarks on the reverse -- a crossed "W" with 3 dots above and 1 dot below, along with the number "13" with what looks like a key under it. 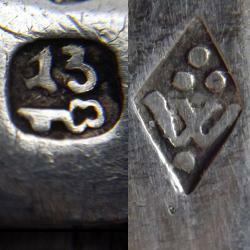 Could this be 13 Loth German silver? At least 3 German cities had a key in silver marks. Bremen and Soest separately from Loth number and Worms with Loth number within the mark, but the key was on top. At least what I have seen.